VATICAN CITY (CNS) — Never speak, act or make a decision without first listening to the Holy Spirit, who moves, troubles and inspires the heart, Pope Francis advised. A cold and calculating heart that is closed to the Holy Spirit results in a faith that is “ideological,” he said May 29 during a morning Mass in the chapel of the Domus Sanctae Marthae. Knowing God and his commandments, and being good are not enough, the pope said. One must also receive God’s gift of the Holy Spirit and let him “trouble” the heart. If people were to get a “spiritual electrocardiogram,” the pope asked, would it be flatlined because the heart is hardened, unmoved and emotionless or would it be pulsating with the prompting and prods of the Spirit? “Am I able to listen him? Am I able to ask for his inspiration before making a decision or saying something or doing something? Or is my heart serene, without emotion, an immobile heart,” much like the doctors of the law had, he asked. “They believed in God, they knew all the commandments, but the heart was closed, immobile, they didn’t let it become troubled,” the pope said. “A person who does not have this movement in the heart, who doesn’t discern what is happening, is a person who has a cold faith, an ideological faith,” he said. The pope asked people to reflect on their relationship with the Holy Spirit and pray that the Spirit guide them in the choices they make. “I ask that he give me the grace to distinguish the good from the less good because good can be distinguished from evil easily,” the pope said. At morning Mass the next day, May 30, Pope Francis reflected on how pastors and bishops must be ready to leave their flock and follow God’s call to head somewhere completely unknown. He must see his life as having no importance to himself, and do everything to serve God and his people “without compromise” and with courage, the pope said. Ministers will be like Paul, who was called to leave the church at Ephesus and head to Jerusalem, where “what will happen there I do not know,” except that he had been warned hardships and trouble would await him. 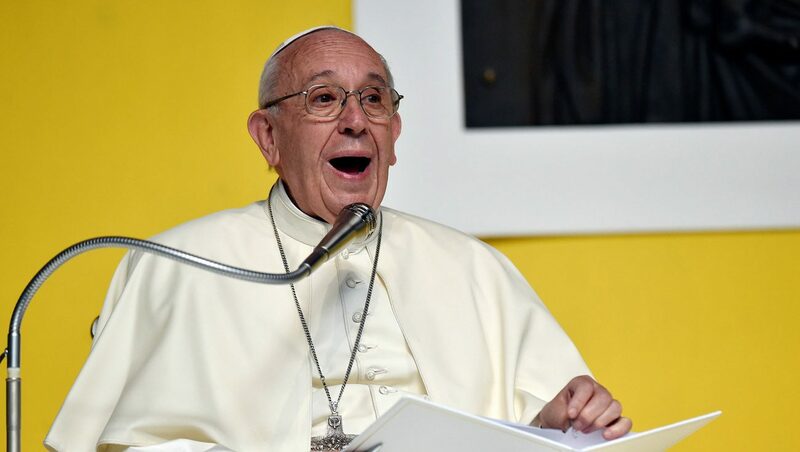 A pastor who does not learn to leave his post well does not have a good relationship with his flock and has formed “a bond that is not purified by the cross of Jesus,” the pope said. There is no hope for the Catholic Church until it realizes that the Holy Spirit is a SHE!